Weather forecasters, hydrographers, oceanographers, fisheries officers and maritime safety experts from around the Pacific region have gathered in Nadi, Fiji, today to take part in training to boost understanding, monitoring and forecasting of oceans and tides. First Secretary of the Australian High Commission in Suva, Raymond Bojczuk opened the training, which is jointly organised by the Pacific Community (SPC) and the Australian Bureau of Meteorology under the Climate and Oceans Support Programme in the Pacific (COSPPac). “The timing is right to boost regional capacity to monitor and forecast ocean conditions,” Mr Bojczuk noted, recognising the severe wave damage many coastal communities in Fiji experienced during Tropical Cyclone Winston and the numerous inundation events that have threatened low-lying atolls across the region in recent years. According to meteorologists and oceanographers present at the workshop, strong El Niño conditions contributed to many of the ocean and climate extremes experienced in the Pacific in 2015 and early 2016. An El Niño occurs when ocean temperatures in the central and eastern tropical Pacific Ocean become warmer than average, and this causes changes in the prevailing trade winds. El Niño conditions typically last for about a year and are associated with noticeable changes in rainfall, sea level, and the frequency and severity of tropical cyclones. 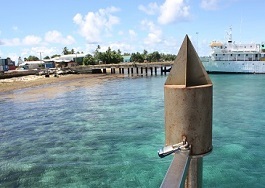 A key component of COSPPac, the Pacific Sea Level Monitoring Project, is a network of 14 tide gauges across the region, providing continuous data on temperature, tides, and weather for more than 20 years. The real-time data from this project is openly accessible online on the newly developed COSPPac Ocean Portal. “The Ocean Portal also serves up near real-time Pacific Ocean data such as sea surface temperature, wave forecasts, surface current forecasts, coral bleaching alerts, and seasonal sea level variations as user-friendly maps and graphics,” SPC’s Manager of Oceans and Coastal Geoscience, Jens Kruger, said. This information can be very useful to any public or private sector organisation that interacts with the ocean, including shipping, fisheries, tourism, disaster management, conservation, and coastal infrastructure development. “Now that this information is available, it is our duty to ensure the right people know how to access and apply it to improve our preparation and resilience in the face of extreme events,” Mr Kruger said.